*1. 728,189　*,728,189　Nogizaka46 "Hadashi de Summer"
*4. *36,683　*,*36,683　Puzzle & Dragons Cross OP "WE ARE GO" by UVERworld (incl. in "WE ARE GO / ALL ALONE"
*6. *28,879　*,*28,879　Namie Amuro "Hero"
*8. *24,322　*,*24,322　Afilia Saga "Lost In The Sky"
11. *17,942　*,*17,942　SCANDAL "Take Me Out"
12. *17,586　*,*17,586　DIR EN GREY "Utafumi"
17. *10,466　*,*10,466　SKY-HI (Mitsuhiro Hidaka From AAA) "Nanairo Holiday"
39. **3,755　*,166,944　NEWS "Koi wo Shiranai Kimi e"
40. **3,576　*,**3,576　Passepied "Nagasugita Haru / Hyper Realist"
45. **2,743　*,**2,743　Aikatsu Stars! Inserted Song Single 2 NatsuColle (Hachigatsu no Marina) by AIKATSU☆STARS! 60. **1,616　*,298,719　Hey! Say! JUMP "Maji SUNSHINE"
63. **1,436　*,**1,436　Asami Imai "Sabaku no Ame"
70. **1,265　*,**1,265　JAM Project "Shining Storm ~Rekka no Gotoku~"
82. **1,081　*,822,181　Arashi "I seek / Daylight"
84. **1,054　1,517,700　AKB48 "Tsubasa wa Iranai"
97. ***,912　1,293,110　AKB48 "Kimi wa Melody"
100. **,867　*,*43,248　Genki Zenkai DAY! DAY! DAY! by CYaRon! *1. 257,787　*,257,787　Hey! Say! 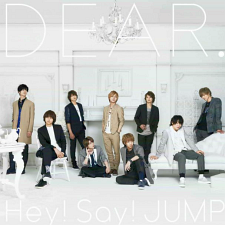 JUMP "DEAR." *2. *83,179　*,*83,179　Spitz "Samenai"
*4. *28,003　*,201,980　Kana Nishino "Just LOVE"
11. **7,185　*,*49,910　Ayaka "THIS IS ME ~Ayaka 10th anniversary BEST~"
14. **5,063　*,**5,063　petit milady "CALENDAR GIRL"
15. **4,849　*,105,535　Walküre "Walkure Attack!" 18. **3,991　*,**3,991　VALSHE "RIOT"
28. **2,448　*,**9,365　GLIM SPANKY "Next One"
37. **1,815　*,*49,856　UNISON SQUARE GARDEN "Dr. Izzy"
42. **1,658　*,177,277　Kobukuro "TIMELESS WORLD"
46. **1,539　*,*26,838　Leo Ieiri "WE"
50. **1,366　*,**7,509　Kou Shibasaki "Tsuzukou Utau"
58. **1,168　*,*17,553　Quruli "Kohakuiro no Machi, Shanghaigani no Asa"
63. **1,111　*,**1,111　Machico "Ambitious*"
64. **1,100　*,322,971　Nogizaka46 "Sorezore no Isu"
72. **1,004　*,*28,989　Yoshino Nanjo "N no Hako"
79. ***,905　*,193,334　ONE OK ROCK "Niche Syndrome"
81. ***,880　*,278,541　Ikimono-gakari "Chou Ikimono-gakari~Tennen Kinen Members BEST Selection~"
87. ***,802　*,*26,102　MY FIRST STORY "ANTITHESE"
94. ***,771　*,*38,791　Ayumi Hamasaki "M(A)DE IN JAPAN"
@Ejc 1. I'm sorry I assume too much. Maybe because I assume that you assume that I'm butthurt on my first post. Actually I planned to remove the butthurt words since it assumes too much but I forgot. 2. No. It's not a problem at all. I typed this answer last post but I deleted it because I thought you're butthurt. 3. Yeah, it's not important, but personally, it's an interesting piece of fact, especially since I'm a crazy anime fan I even care about anime songs, that's why I shared my thoughts about it especially it's a good bit of history on Johnny's West. 4. I dunno. But I think they really care about their sales since they released it in the month-end (assuming month-ends are paydays). Well that's good to read. I've really been enjoying this season. I didn't know the Beppu brothers were voiced by new VAs so interesting! I hope this show will help them succeed. Now all I need is for the DVD/BDs to sell a decent amount. About that, I don't know whether to trust Stalker or not. It's predicted to sell poorly (season 2), but I can't see why considering the music sells, plus more chara goods, merchandise, events, games etc. are being announced. Johnny's West's new single sales surpassed its earlier single sale, I believe, but they are unlucky to get the #1 because of that popular female idol group. This is the first time they don't get the #1 in Oricon. Did I say it's a problem? Why are you so butthurt? I'm just stating the facts, an interesting fact, actually. And I expected for Johnny's West not to get a #1 sooner or later if their single debut sales just stayed around 100,000 as usual, and other singles performed by female idol groups and performers are released within the same week (which finally happened this week). They are even lucky to streak #1 since debut. They are lucky enough not to match up with the likes of AKB48 and Arashi. And falling to #2 does not change the fact that the debut sales of their singles are crazy. And I already stated the fact that their debut sales on OP2 surpassed the debut sales of OP1, but it's not that clear. Here's my quote "Johnny's West's new single sales surpassed its earlier single sale, I believe"
I don't know about the pattern of sales of Nogizaka46, but if their sales drop off big time next week, Johnny's West may beat them. 1. I don't even care at all about the mainstream artist sales, so how can I be butthurt? It's more like you are the one butthurt because they didn't get #1 this time. 2. It was clear what you said in the first part about their sales being higher than the previous single, but I had to restate it to answer the question I asked, "Is not getting #1 a problem?". The first part is all that matters, while the second part has little importance, except for ego boosting and for the media to make a big deal about. 3. Obviously, you cannot control what is being released alongside your CD, but there's no reason to make a big deal over weekly ranking. You stated one interesting fact, which I agree with, but it is as I said, of little importance in the larger scheme of things. 4. Please read again what I originally posted. I asked a question, then I said what the artists would be probably thinking over these sales, and then stating why being #1 or not, depends on the competition in a given week. Where was I butthurt in my response? Or are you just trying to pass your butthurt feeling onto someone else? 5. Lastly, if you post rubbish in response again, I will not waste my time replying to you. Rather, they've improved this season. It took season 1's OP eleven weeks to reach 7,757 copies. And it took season 1's ED ten weeks to reach 5,296 copies. Bear in mind that season 2's ED was by FukuJun, Kamiyan and Terashii, pretty well known seiyuu, especially the former two. For comparison, season 2's OP has reached 6,635 copies in just two weeks. And season 2's ED has crossed 3,002 copies in two weeks as well. (Again, the Beppu brothers are voiced by real newbies a stark contrast to season 1). P.S The old OP, ED and chara singles are out of stock/nearly out of stock on Amazon. tl,dr: This season is a massive improvement. The sales are ridiculous! 7000+ in Top 25?! Is it because the paytime is around the end of the month? The ED is starting off much better than the OP, but the OP had such a good week this time around. Is the series finally catching on with female otaku? I hope so. I want it to do well. I can't remember, but were Boueibu's CD sales this meh? I seem to remember Boueibu having a slow start as well, but since it's a pre-established work I figured it would be doing better. I really hope this season does well. It's already 10x better than the first. Whoaa those sales are amazing keep the good work up B Project <3 I wanna see more of the anime in the future !! *4,849　*,105,535　Walküre "Walkure Attack! At least the Album is still selling well !!!! Also not sure where it came from but ST@RTING LINE - 12 THE bit should be removed from DIR EN GREYS Utafumi line. Fixed, Thank you. I'm not sure why part of the title of the next CD on the ranking got to that line, either. Comparing 青春Jumping Heart's week 2 total with the week 2 totals of the 1st and 2nd single of Aqours... it seems to be doing pretty well. Let's see how the upcoming Insert Song 1 single (決めたよHand in Hand／ダイスキだったらダイジョウブ！) ends up doing in week 1. Other Love Live! related sales for this week. Could Aqours' first single get gold disc certification with these sales for July, or do we have to wait for August? BiBi's 錯覚CROSSROADS got gold disc certified with 76,905 Oricon sales, so it could be close. μ's Best 2 is very close to the 150,000 Oricon sales milestone, but too bad μ's Best 1 didn't make it this week due to the Album Top300 threshold for the week. Still waiting on news of the release date for the μ's COMPLETE BEST BOX album. Fab to see Utafumi selling well, first time I've seen DIR EN GREY on these rankings. Cannot wait to get it in my hands. The promo vid was suitably superb. Nice to see Million Clouds sell relatively well also, lovely song. Latest 2 Osomatsu-san Drama CDs didn't do well as first 3. Osomatsu-san fever died down, or Todomatsu not popular? I cannot wait for last Drama CD with everyone.